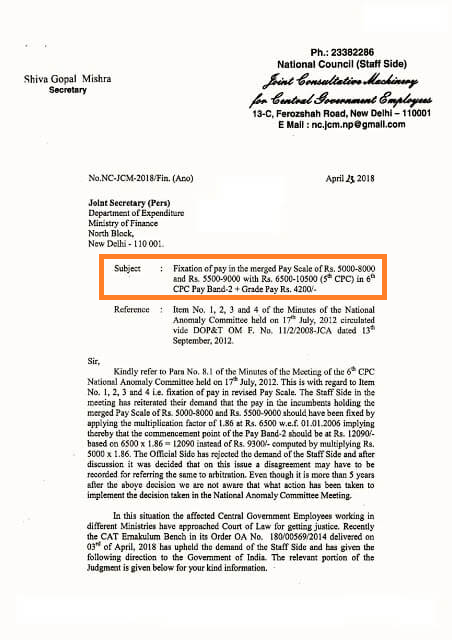 Subject : Fixation of pay in the merged Pay Scale of Rs. 5000-8000 and Rs. 5500-9000 with Rs. 6500-10500 (5th CPC) in 6th CPC Pay Band-2 + Grade Pay Rs. 4200/. Kindly refer to Para No. 8.1 of the Minutes of the Meeting of the 6th CPC National Anomaly Committee held on 17th July, 2012. This is with regard to Item No. 1, 2, 3 and 4 i.e. fixation of pay in revised Pay Scale. The Staff Side in the meeting has reiterated their demand that the pay in the incumbents holding the merged Pay Scale of Rs. 5000-8000 and Rs. 5500-9000 should have been fixed by applying the multiplication factor of 1.86 at Rs. 6500 w.e.f. 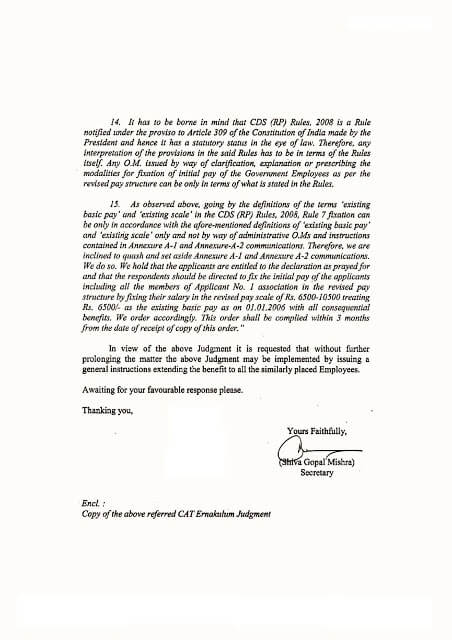 01.01.2006 implying thereby that the commencement point of the Pay Band-2 should be at Rs. 12090/- based on 6500 x 1.863 = 12090 instead of Rs. 9300/- computed by multiplying Rs. 5000 x 1.86. The Official Side has rejected the demand of the Staff Side and after discussion it was decided that on this issue a disagreement may have to be recorded for referring the same to arbitration. Even though it is more than 5 years after the above decision we are not aware that what action has been taken to implement the decision taken in the National Anomaly Committee Meeting.